If you're wondering why Red Dead Redemption wasn't up for any awards at the BAFTAs last night, it's because Rockstar chose not to enter it - and BAFTA "doesn't have the right" to enter it on its own. The 2011 GAME British Academy Video Games Awards were held last night and Red Dead Redemption, Rockstar's hit Wild West sandbox game that just a couple of weeks ago snagged four awards including Best Game Design and Game of the Year at the Game Developers Choice Awards, didn't win a thing. Why not? Because it wasn't actually there. And why not? Because Rockstar chose not to submit it for consideration and the good folks at BAFTA, the British Academy of Film and Television Arts, can't do it for them. "We don't have the right to automatically enter a videogame," explained BAFTA COO Kevin Price. "We encourage the publishers and developers to enter. We're not happy that Rockstar game isn't in the longlist this year, but the simple answer is it wasn't entered." Complaints that the absence of Red Dead undercut the credibility of the awards are misplaced, he said, because their intent is to draw public attention to the industry and the art. He pointed out that there's actually a subtle upside to the whole thing because the controversy has people talking. "When we make a decision on Best Game or the winner of a category, we're not saying there's only one good piece of work. It's all about getting the public thinking about what makes a good videogame," he continued. "So no, in short I don't think it affects the overall purpose and the quality of the Awards. We would rather that game was in the longlist and we'll continue to encourage Rockstar to enter in the future". Rockstar chose not to enter the game, according to "sources familiar with the matter," because it's still sore about the 2009 awards, when Grand Theft Auto IV was nominated in six categories but failed to win a single award. 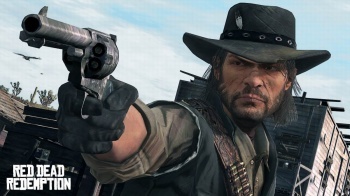 Red Dead Redemption was nominated for the 2010 GAME award, the only award voted on by the public, but lost to Call of Duty: Black Ops.